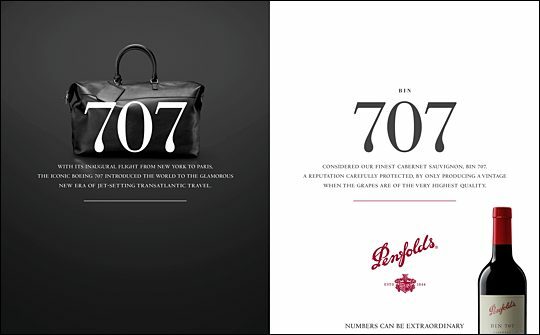 Penfolds new ‘Numbers Can Be Extraordinary’ brand campaign conceived and delivered by Leagas Delaney commenced last week. Developed across print, digital and out of home [OOH], the campaign will run globally including Australasia, the UK, US and Asia. In a deliberate break from the standard conventions of the wine category, the new campaign, shot in Paris by luxury brands photographer Maud Remy Lonvis, is designed to be distinctive across all media. It combines breath-taking photography with intriguing facts about the numbers that define Penfolds iconic wines. The campaign idea owns the concept of numbers by connecting the brand with contemporary culture and a luxury lifestyle, from jet setting travel to objects of great craftsmanship and beauty - all things aspirational to a global luxurian. The monochromatic nature of the main image photography, the white space and the accent colour of the red in the branding and bottle imagery use Penfolds colour palette to powerfully brand the campaign. The campaign will run in English as well as Mandarin and German, taking audiences on an inspiring and intellectual journey through The Penfolds Collection. 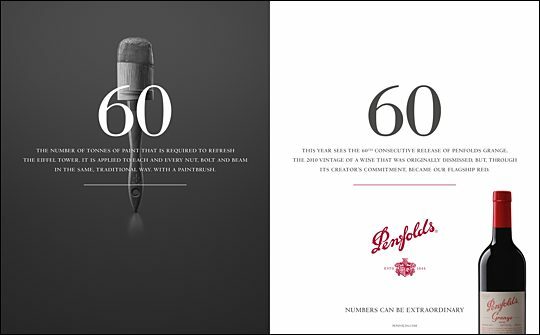 The campaign extols the virtues of various treasured Penfolds numbers spanning 170 years of winemaking history, including the number ‘60’, a significant milestone as the brand celebrates 60 consecutive vintage releases of Grange.